Before the collapse of the debt markets in 2008, mezzanine debt was a regularly relied upon element of most development strategies. Mezzanine debt vehicles offered a passive instrument that allowed non-managerial investors to participate in skyrocketing development returns. When the markets were turned upside down, one of the very first debt instruments to evaporate from a developer’s world was the once-common mezzanine debt component of the capital stack. So, with the recent resurgence of the development sector, how has the face of the mezzanine debt industry changed? Is it the same heavily brokered, privately-backed segment it once was or has it re-emerged as a more refined and professional slice of a developer’s capital stack? Mezzanine loans differ from standard bank-issued loans because the mezzanine debt is not secured by a recorded lien on the property. Instead, a borrower provides a mezzanine lender with security through a security agreement against the stock of the ownership entity listed on the property’s title. Where a standard bank loan consists of a Note and securing Mortgage, a mezzanine loan is comprised of the same Note but uses a Security Pledge Agreement rather than a recorded mortgage. A default under a mezzanine loan results in similar actions by the lender. If the borrower defaults, the mezzanine lender forecloses on the stock of the ownership entity rather than on the title to the underlying property. However, the difference in a mezzanine loan is that it typically sits in a position junior to a senior loan so that a mezzanine lender may foreclose on the ownership entity simultaneously to a senior bank foreclosing on the underlying property. Because a mezzanine loan sits in a position junior to a senior (or first trust) loan, a common perception is that mezzanine loans carry more risk than a first mortgage loan. The conventional “capital stack “diagram depicts a first mortgage as the stable” foundation of a project’s necessary capital further, perpetuates this notion. Yes, a senior loan’s lower interest rates make it more attractive to developers than the typically higher rates associated with a mezzanine loan, but can project costs be limited strictly to monetary costs or should developers contemplate default risk when properly assessing proper capital deployment? The benefits and risks associated with a first mortgage are widely accepted within the development industry. While any instance of default may result in foreclosure, a first mortgage lender typically provides developers with complete managerial control of the project. While non-recourse loans present even less personal risk to developers, many non-recourse loans carry “bad-boy” provisions, which hold borrowers personally responsible for improper management of the project. So, would developers be betters served to allocate more capital towards mezzanine financing? Assessing the risks inherent to mezzanine financing may not be as clear-cut as a first mortgage analysis. Because mezzanine debt is secured by the stock of the company that owns the property, the investor faces the possibility of losing the project in the event of default. However, mezzanine lenders are often private individuals or companies – many of which are not interested in taking over full managerial responsibilities of a large-scale development project. 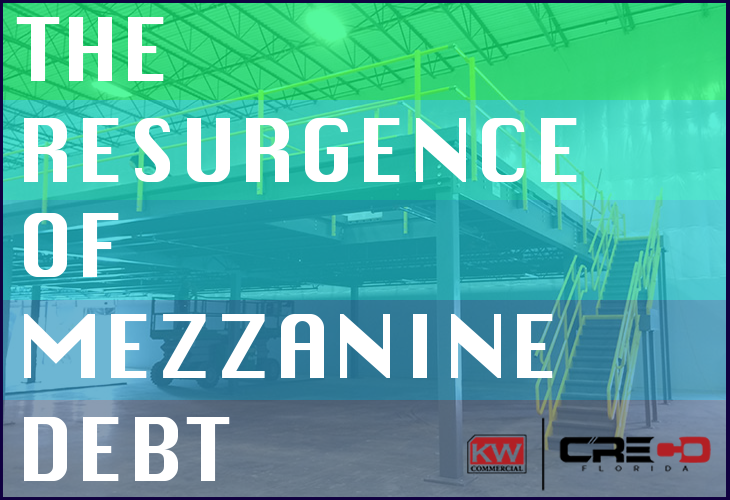 Given that an astute developer may be able to anticipate an imminent instance of default, there are many cases where terms of mezzanine debt are restructured to accommodate shifting market patterns, project enhancements, or cost overruns that were not originally contemplated. This pliability may ultimately prove more valuable to the project and outweigh the higher interest rates associated with private mezzanine capital. Perhaps this rationale provides evidence as to why developers of all sizes are very familiar with the intricacies of the mezzanine debt market. It is a standard development debt vehicle, which if used prudently, provides developers with the leverage necessary to provide above market returns to investors and other stakeholders. If you are interested in pursuing a mezzanine loan, a Google search may provide a good list of advertised mezzanine lenders, but be a bit wary of firms soliciting mezzanine products. Instead, try focussing on local, private individuals or lending companies who are familiar with the development area and who can remain flexible as local market conditions fluctuate. If you want a second opinion on a presented mezzanine loan term sheet, feel free to contact KW Commercial and we will review it to ensure that each and every loan term is transparent and advantageous to your development and financial objectives.